The client is a leading Transportation Management System (TMS) provider that optimizes freight purchase and management using cloud technologies for customers across Canada. Client needed a flexible platform that used EDI (Electronic Data Interchange) and web services to perform TMS product actions with very minimal programming efforts. The client required digital transformation to create a futuristic onboard TMS product that will manage several processes and functions to provide accurate and real-time information. Functions include tracking vehicles, mapping real-time vehicle location, providing a list to drivers for deliveries or pickups and reducing fuel expenses. The data stored in the client’s server had to be accessed using the associated web application via the internet. The web application should provide a driver portal for the drivers to know or edit their hours of service logs. Client wanted a 360-degree test environment to ensure that all the various versions of its on-board devices will function effectively. Considering the testing scope and maintenance, we used the latest testing technologies for TMS product that enabled their teams to smoothen their workflows. 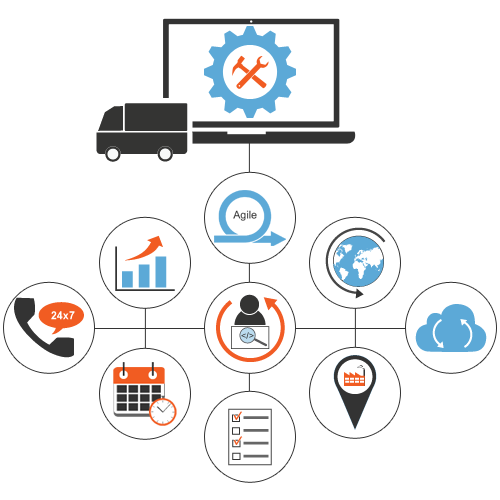 Our team of domain experts provided executable transportation management plans to the client, which were cost efficient and helped them to achieve their on-time deliveries objectives. We allowed quick access to the client’s customer delivery, billing, and payment data for greater responsiveness and more accurate recordkeeping. With 360-degree test environment, we increased shipment and PO visibility while reducing inventory management problems. The future of this Industry is covered with both innovation and technology. The client and their TMS product adopted our technologies which offered faster, cheaper, more reliable, and sustainable business practices. Our team performed different testing techniques such as adapting agile business processes with consistency, repeatability, and reusability that helped the client in enabling digital transformation.